Interests:Video games, music, humor and writing stories. Also, old screwball comedies, TV shows, and British comedies. It has been quite a long time since I made any updates about this project. I still work on it whenever I have free time (which has been a little scarce.) I dug back a few pages in the forum and looked over my old thread, but it didn't help me figure out where I left off, so I hope it is okay that I've started a new topic instead. I love Dragon Quest's freedom to stray outside the storyline a little. Imitating this eats up a lot of my time. Especially from correcting all kinds of errors when I testplay all the "what if" and "just in case" options. It often feels like I'm making no progress, but I still really have fun with it. As an example, while meeting Trode he will want Stella to join the conversation. At first he is going to send you to get her, then realizes he could just have her summoned. Choices like this affect personality, but I haven't reached a point where that means anything. Another type of "just in case" scenario: trying to progress the story when someone is in no shape to continue. I also have to keep an eye out for NPCs who talk to specific characters in the party. I added the imperial travel scrolls, so the game can be saved at any point. The catches are that you have to buy them because they are only good for one use and only a limited amount can be carried. I expected to have a lot of problems with these, but no trouble so far. Doors don't shut on you and wandering NPCs can be walked off of if you happened to save on their starting point. ...or head below deck and gamble your way across the ocean. You can visit the ship again later and find there are more games. The friend of the hero creation has been updated. I originally had them using unique graphics, but I've changed that to be the same options as the hero's. However, outfits reflect vocations now and there are two skin tone options. At night, some dungeons require a torch or radiant. Others can be lit or dark at any time of day. Here are some other various screens. I've also updated and added songs. I'm hope most of what I've posted is not just a bunch a stuff I posted 100 years ago! There's still a long way to go, but it is consistently progressing. Now I'm going to browse the other fangames on here. I haven't looked around in too long. Image links were broken. Edit 2: Links still broken so uploaded direct. Holy cow, that's all so awesome! I especially loved the trying to board the boat with a coffin comment! Interests:Dragon Quest, Star Trek, James Bond, Movies, Twitch Streaming, TV, Music, Baseball, Football, Hockey, etc. Looks incredible! I highly enjoyed the demo and I can't wait to see more. Trode and Stella bickering is an amazing idea. Keep it up! They do fit the bill as the perfect bickering couple haha. Add Maribel in the mix and everyone would want to bang their heads on walls. Thank you so much! Almost immediately after I posted, I became overly self-conscience. Fortunately, I had a very busy day today! For some morbid reason, these are some of my favorite dialogs to write. I guess because the situations are typically so absurd. Initially, I had regret about picking two of the blabbiest characters in the series. I constantly refer to their in-game dialog in hope that their characterizations will stay reasonably close. Never thought about how it would be with Maribel. Now there's an idea to consider. It would be the anti-love triangle! Hello! It's been over a year since I posted and I thought I should do another update to prove I'm still working on this. Most of my work has been on events and music, so not much to screens to actually show. As for music, after receiving some encouragement from Hawkeye and Erdrick the Hero, I dove back into FamiTracker. I had trouble figuring it out on and off for years, but I had no trouble this time. I was able to remake every song I had done for the game so far. I mixed them outside of FamiTracker because I wasn't too good with volume levels at first. I'm getting better though! I will post a more extensive list in the art & music forum. Glad to hear (literally) you're still going! Also pumped to hear this project is still going! Excited to see more. And your NES covers are fantastic! Happy Humming sounds absolutely professional like it was ripped from an actual NES game. Great work! Plattym, Hawkeye, thank you! Happy Humming did not give me much trouble as I already had it stripped down to use with my old method. I plan to release some form of demo at some point sooner than later as I am closing in on a good end-of-demo point. I'd be surprised if it was sooner than early next year. Good old glitches and bugs. Side note: Love the streams I've seen Hawkeye and I'll keep keeping my eye on your twitter feed. Advance thank you to anyone who wants to try it out. To explore everything it took me 1 hour 45 minutes. To rush through the story it only took a mere 15 minutes. If you run into any problems or have questions, please let me know! Interests:Drawing, animating, playing Dragon Quest (III, IV, V and VIII are my favorites), playing RPG's in general (Mother, Final Fantasy, Chrono Trigger). Played a little bit of the demo today, really enjoying it so far! 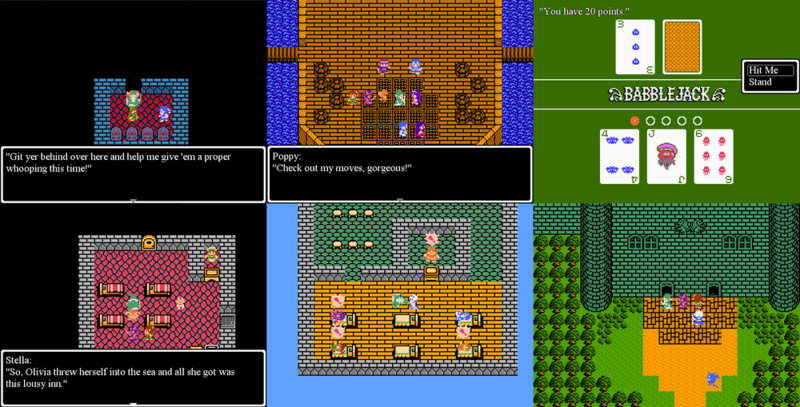 You've nailed the Dragon Quest feel - the NPC interactions are charming, and the music makes me feel very nostalgic. I really like some of the new stuff you added as well, like the ability to pick your character's appearance, the type of relationship with your teammate and being able to save on the world map. Seeing Trode and Stella was also a nice surprise. I'll let you know if I run into any problems, but so far so good! Garrick Bold is the font used in Dragon Quest XI and maybe even VIII (not sure but it's not in front of me). Looks good so far, I like the appearance choice as well, as well as the appearance of the Trode and Stella. The helpers when you die is a nice touch too. Nice having the bank in there, and impressive work on the Slots and babblejack. One thing I did notice, during battles on the ship, a "Bilshe" was attacking from my party, but there wasn't a Bilshe in my group. So I assume the end of the demo is when you meet Burr and Princess and cannot access any of the castles, etc? I liked the type changing monsters in the tower of Garuda (spelling). I definitely enjoyed playing thru it, cannot wait until you release more of it. Thank you ChrystalChameleon, Erdrick the Hero, and Woodus! I'm glad you took the time to try it out. Erdrick: I will check out that font when I get home. 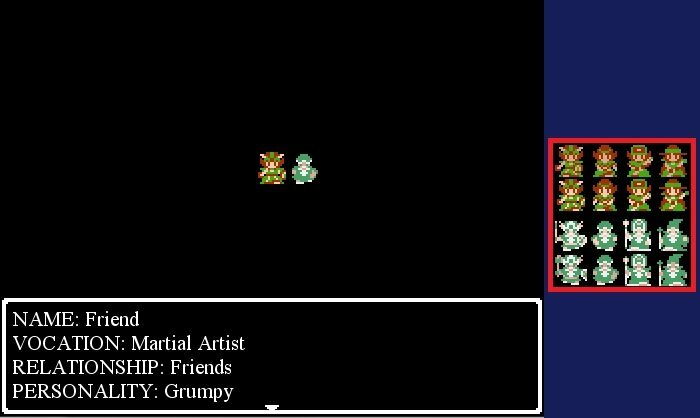 I was unable to get the NES DW font to work and I didn't spend any time trying to figure it out. I like the idea of using the font of the later games. I appreciate you sharing this information and look forward to trying it. Woodus: I apologize that you didn't get the end of demo message. I had forgot to re-enable before uploading it. I should have updated my post here when I fixed it, but thought I got it before anyone saw it. It allows you to go back before the previous scene to continue playing and not lose progress. 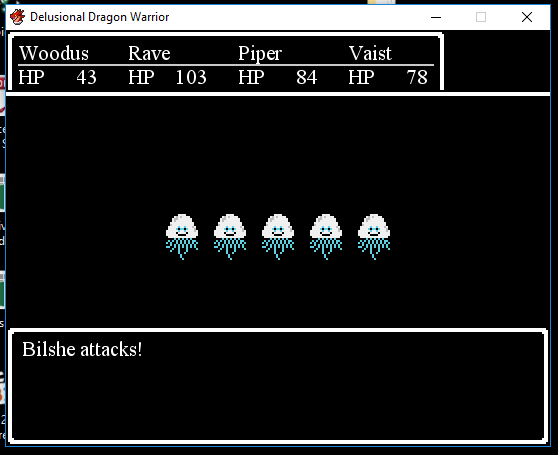 Also, the fifth party member is okay. I didn't work on making them appear in the top window out of fear causing a crash from my novice ability to edit scripts. Thank you all again. You made my day! Ahh, it was a 5th member, OK, I thought the names got mixed up, I did see Bilche on the deck so I knew that character existed. And no worries on the end of demo message Great work! Ack! Literally setting a reminder to myself to download and play this demo this weekend! Super stoked! ...I actually haven't had a chance to try the latest demo, unfortunately. Internet here is total crap so I haven't been able to download it. I saw the screenshots, though. 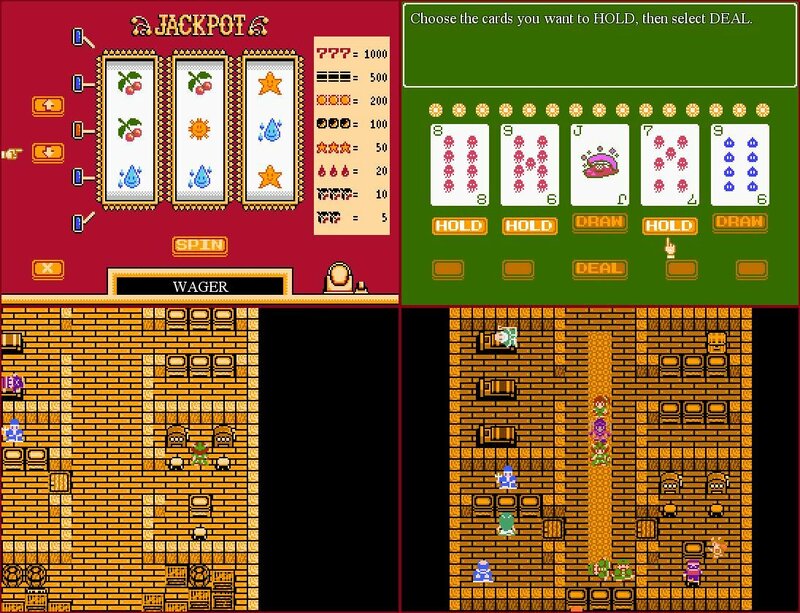 I have my own recreation of the NES font somewhere that should be visually identical to Woodus' (I think he made the other one floating around), but was very likely created by a different piece of software as his (I used the website, FontStruct). If I can find it/redownload it, I can send it to you for you to try out if you'd prefer it over Garrick Bold. I have my own recreation of the NES font somewhere that should be visually identical to Woodus' (I think he made the other one floating around), but was very likely created by a different piece of software as his (I used the website, FontStruct). Thanks Hawkeye! I hope you will enjoy it when you get the chance! I will definitely try all fonts. If I can make one work, I'll use it. I'll look for yours here on the den, Woodus. 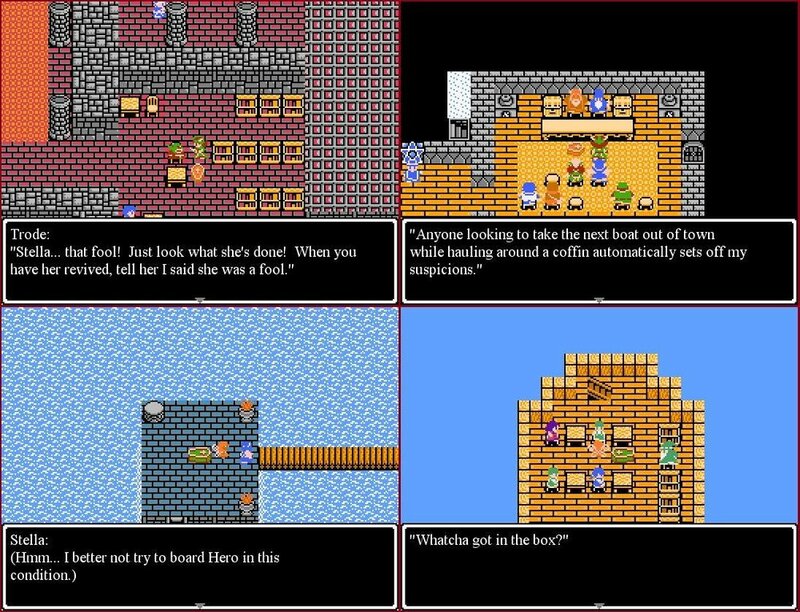 Erdrick the Hero, I would like to try your NES version too. I used the travel scroll name due to their one-time use. There is a casino reward that the Rebirth Stone moniker will work for perfectly! For anyone interested in the side quests, I'll put them in spoiler tags. There is an optional dungeon south of the first town. Taking Stella with you makes it easier. She doesn't mind sidetracking. You can find a custard pie if you visit Academy Tower's kitchen at night. It can be traded later, but there is nothing particular special about either item within the demo. In the full game it will not be permanently unobtainable if it is missed here. When traveling on the ship, you can earn extra casino coins by finding hidden monsters and securing barrels back into place with the ropes laying around. There are five hidden monsters and three loose barrels. Each task increases the amount you gain at the end of the trip. One monster is almost unavoidable. 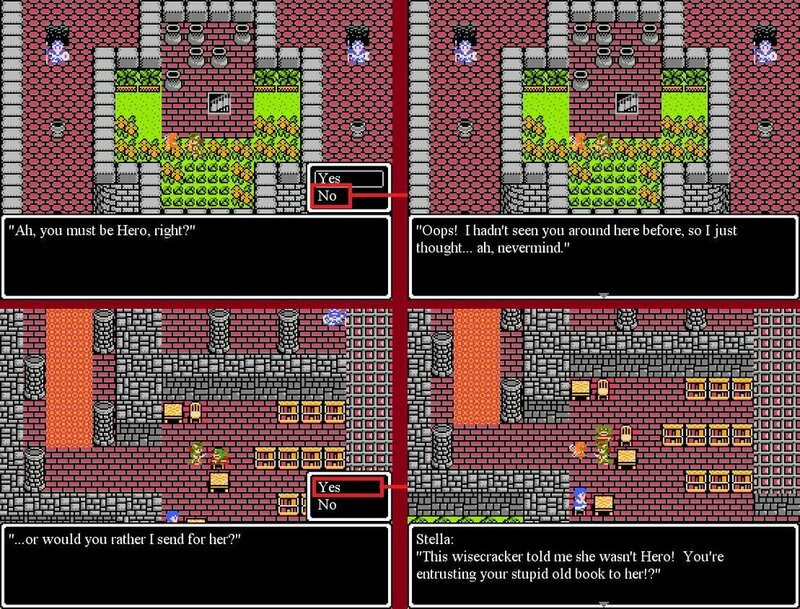 Between Baharata and Dhama is a bridge to an area that was Kandar's second hideout in Dragon Warrior 3. The prisoner there begins a sidequest. I'll put more detailed info in the next spoiler tag. I realized just now that there is no special dialogue from the party if you do this before getting ambushed. Next one goes together with the above. After talking to the prisoner, head to village of Muor by following the mountain range southeast of Dhama Temple. You will encounter a small shrine. Follow the coast northbound to find Muor. (Sidenote: This village has the best shops in the demo.) There is a small house on the south side of town with a locked door. At night you can knock on the door and encounter the gang of bandits. This will only happen if you've talked to the prisoner mentioned above. Also, this quest will always be available even if it is missed at this point in the story. The Tower of Garuna offers challenge battles. Only the eye master is reasonably defeatable. I haven't set up any rewards for the other two, they just complain if defeated. If you play a mage, Stella will get on the boat with you. Here are where my fonts are located, I pulled down the Fontstruct ones I made as well. So I have the DW1 from CorelDRAW and Fontstruct and the Nimzo from CorelDRAW and Fontstruct. @Erdrick The Hero if you find yours can I add it to the list? Which I added to my font list page above. I've never run across one myself, but I was under the impression that Dragon Potions were one-time use. @Woodus sure, if I find it.